I’m convinced that if babies could give their opinion on whether breastfeeding is better, they wouldn’t even see why anyone could question it. It makes intuitive sense that breastfeeding is the way we are meant to feed our babies – why else would we have all the necessary equipment? And how else would humanity have survived until now? If you accept the premise that “you are what you eat”, it makes sense that feeding a baby the right food (breast milk, of course!) would give you the healthiest child possible. This doesn’t mean that every breastfed child is a picture of health; after all, health is about more than just nutrition. But it does mean that, in any given situation, feeding a baby breast milk is likely to result in better health that if we don’t feed that baby breast milk. So, what are some of the advantages of being a breastfed baby? Breastfed babies grow in a healthy way. They tend to gain weight a little bit more slowly that formula fed babies, but this is normal and a good thing. Formula fed babies have a much higher risk of being obese as children and even into adulthood; and with obesity comes and increased risk of all the lifestyle diseases such as diabetes and heart disease. On the other hand, those babies who do get “fat” on breast milk tend to lose that fat as they get more mobile. Getting fat on exclusive breastfeeding carries no increased risk of obesity later on. Breast milk helps to fight disease, which means that baby gets sick less often. Babies who are not breastfed get illnesses like diarrhoea, lung infections, ear infections and malnutrition more easily. This is because breast milk is full of anti-infective proteins that physically attack any bacteria, virus or other germ that it comes into contact with. Breast milk also strengthens baby’s own immune system to be able to fight illness more effectively: when breastfed babies are vaccinated or exposed to a germ, they produce more antibodies and develop a stronger resistance to disease. When a breastfed baby gets ill, the illness is usually milder and passes much more quickly. Breast milk supports baby’s gut bacteria. We all have a huge number of bacteria living in our intestines, some good and some bad. Breast milk contains compounds that feed the good bacteria and kill the bad ones, causing the gut bacteria of a breastfed baby to look very different from that of a formula-fed baby. If the good bacteria in the gut outweigh the bad, baby has a lower risk of all sorts of illnesses – everything from diarrhoea to diabetes. Breast milk is constantly changing to provide exactly what baby needs. From day to day, or even at different times in the same day, breast milk contains different amounts of the various nutrients, all tailored exactly to baby’s needs. The antibodies in the milk also change to protect baby against specific germs that he has been exposed to. Breast milk is gentle on the delicate newborn digestive system. Breastfed babies are far less prone to digestive problems such as constipation and colic. That is not to say that breastfed babies never get stomach problems – but as many mothers will testify, changing the baby to formula almost always makes it worse. Breast milk contains all the nutrients needed for the brain to develop optimally. Breastfed babies literally become intelligent children: studies have shown that children who were breastfed consistently score higher in intelligence tests that children who were not breastfed. Breastfeeding has a life-long protective effect. Even into adulthood, a person who was breastfed as a baby has a lower risk of getting diabetes and heart disease. There is some evidence that breastfeeding helps to reduce the risk of developing allergies. Of course, the development of an allergy is a complicated process that is affected by much more than just diet, but breastfeeding is the one thing that was found in most studies to help prevent (or at least delay) the onset of various allergies. 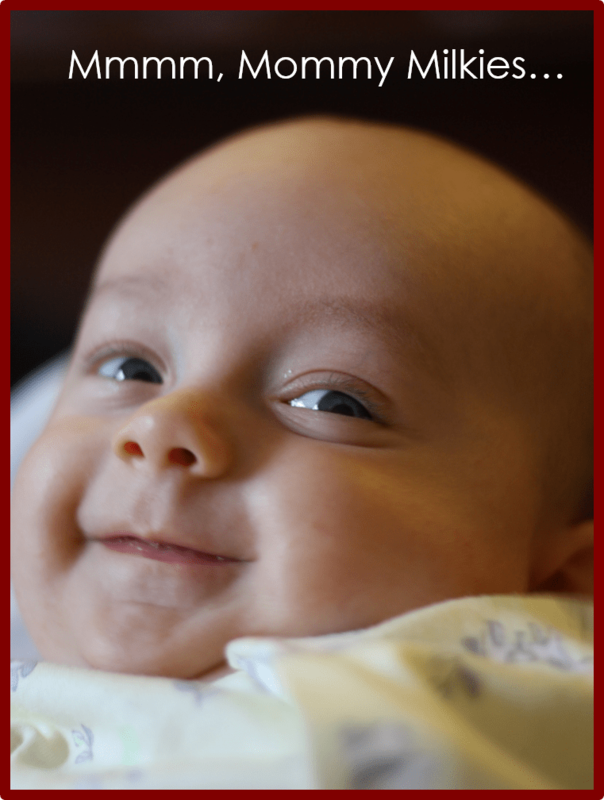 The action of breastfeeding helps the muscles and bones of the face to develop correctly. Babies who drink only from the breast develop a differently shaped palate than babies who use a bottle or dummy. They are also less likely to develop crooked teeth that will need orthodontics later in life (If you are interested in this topic, check out some of Dr. Brian Palmer’s presentations for a lot of interesting insights). Breastfed babies are less prone to developing ear infections. If you’ve ever had to care for a baby with an ear infection, you’ll agree that this is a big thing! The reduced risk is thought to be partly due to the way the throat and jaw move when suckling at the breast, and partly due to the anti-infective qualities of breast milk. Breastfeeding is one of the main factors for reducing the risk of cot death (sudden infant death syndrome, or SIDS). In countries where breastfeeding is the norm, SIDS is very rare event. Along with putting baby to sleep on his back and refraining from smoking, breastfeeding is one of the most important interventions for reducing the risk of SIDS. And let’s not forget that breastfeeding has immense emotional and psychological benefits for baby. Breastfeeding provides babies with a sense of security and lowers their levels of stress hormones. To a baby, the breast is their happy place and their safe house all rolled in to one. You don’t have to convince any baby that breastfeeding is awesome! Wow, that’s quite a list! And the amazing thing is that we’ve only scratched the surface. Every bullet point here could be an article in itself, and science is uncovering new facts about breast milk every day. And we haven’t even touched on the myriad ways in which breastfeeding benefits the mom, the family, the environment or society as a whole. Taken as a whole, then I hope you can agree with me that there really is no substitute for breast milk: nature’s most perfect food, freely available on tap.